Installation of Vertical Blinds: Is very straight forward and requires little expertise or tools. Organise the brackets. 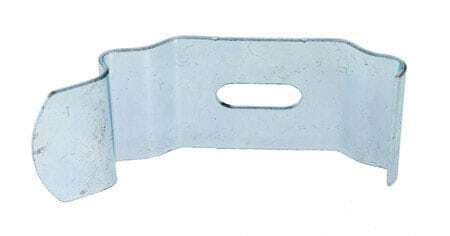 The back of the bracket is represented by the extended metal foot (left side of picture 1) which is used to release the blind once installed. Space the brackets at regular intervals ensuring they are at an equal distance from the front of the sill. The centre of the bracket must be a least 60mm from the back of the sill (otherwise the slats won’t turn freely once hung). Screw the brackets in, slot the rail in securely and finally hook the slats to the runners in the rail.